Lumber prices climbed 37% this year and lumber futures reached a seven-year high earlier this month. So where to from here? The New Year is set to accommodate a diversity of market predictions and forecasts. A variance of opinion is emerging, including this contrarian view at Bloomberg which offsets many of the bullish headlines of late. When demand for lumber increases, prices move up. When production ramps up, the supply/demand balance swings the other way and prices come off. Nothing magical in that. However, there are more markets in play now than ever before. Offshore markets make the equation more complex. Evidence points to a U.S. housing market in recovery mode. The implication of available fibre supply is a question that will not be immediately answered. Some sources indicate that if the ratio of salvaged MPB kill (dry) timber to green in the Interior was roughly 70/30 this year, 60/40 is estimated for 2013. Whether bullish or bearish, all the market forecasts would suggest that good risk management guidelines will need to be followed in 2013. Happy New Year! Ryan Case, a partner at Seaside Funding, a national “flip company” that often offers 60 percent to 70 percent below market rate for properties, acknowledged that would-be sellers would be wise to ignore his agents’ offers. “We are not your best option,” he said. Yet those who find bargain-basement offers tough to swallow – compared with the value their houses had before the storm – sometimes find themselves with little alternative. Mr. Case recounted how one New Jersey woman reacted with outrage at his company’s offer. “She said, ‘I’ll burn the house before I sell it to you guys to make a profit,’ ” he said. But she called back a week later to see if the offer still stood. What are we to make of it? At about the same time as forecasts for lumber demand next year are showing signs of optimism, the Mayans tell us the world is ending tomorrow. For NHL hockey players it seems to have ended a few months ago. For cliff-watchers there are barely a few days left. For Christmas shoppers, it’s coming down to the wire. In many parts of the continent it’s time to pull out some of the alleged 97 Inuit words for snow. In these parts the snow tires should have been installed before yesterday. Meanwhile lumber futures are not betting on it all ending tomorrow. Neither are we. Even so, for at least one lumber trader the matter of clearing up any unresolved matters before the world ends took a serious turn when he found it wasn’t so easy leaving China until a lumber claim was settled. So, we’re not saying au revoir today, … just a toute a l’heure.. 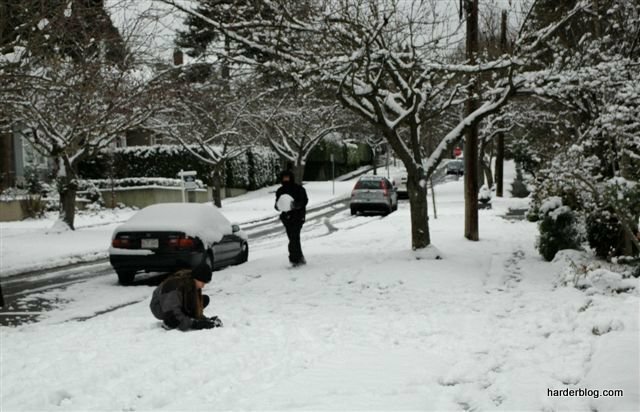 The first snowfall of winter arrived in Vancouver this morning, about the same time as news reports signal a “general chill-out” on many investment fronts. We’re told here that improved housing and signals of “China on the mend” are among indicators that could be blurring realities of greater risks lurking on the horizon. “Myles Zyblock, chief institutional strategist at RBC Capital Markets worries that markets aren’t sufficiently taking into account the risk of an economic-policy debacle.” Strong words. He describes one market volatility index as “a coiled spring” that could be disguising market dangers. For today though, the snowfall here is adding calm to the local landscape – unless you happen to be out driving in it. A surprisingly popular post this time last year featured a little sampling of the Christmas letters my dad wrote to customers and suppliers of Col-Pac Lumber Company from 1972 to 2003. In the earliest years, I remember the Christmas letters were always printed on the company’s crisp Kermit-green letterhead – often in the form of a poem offering up reflections on the year ending. While the so-called lumber market “pause” referred to in last year’s post has been less evident this December in midst of unseasonably active trading, today does mark the week before Christmas – which seemed a good time to pull a few more letters from the archives, available at the links below. 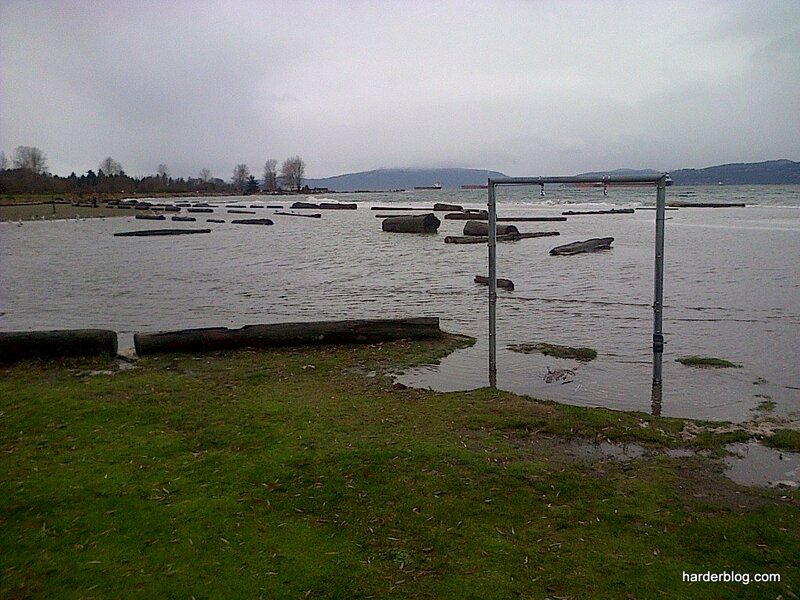 A loyal reader submitted the image below, snapped this morning.. showing logs that normally support reclining sunbathers along flooded Spanish Banks floating away following heavy weekend rains and winds here in Vancouver. With B.C.’s shrinking timber supply in mind, entrepreneurial types may be asking themselves: at what point do these floating logs become fair game for mobile sawmillers? A comprehensive list of log salvage regulations suggests a career in beachcombing might begin with a good lawyer. Until I engaged in the Mandarin Beginner (Level 1) course at UBC following a trip to Beijing in 2004, I might not have understood that Yin-Yang is much more than just a pair of opposites dependent on each other (not to be ascribed inaccurately to the interconnectedness of mill/wholesale/retail distribution channel connections). The discussion is more broadly concerned with communication. 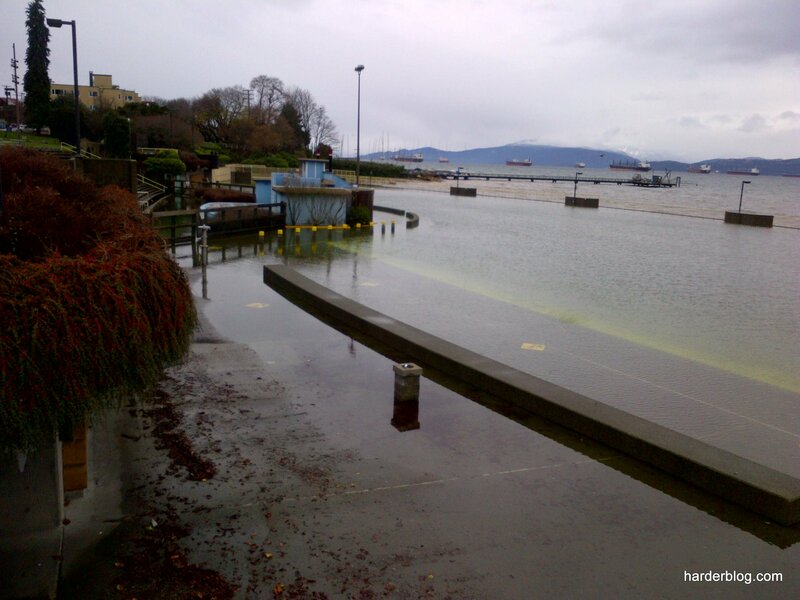 As global markets for B.C. lumber expand, there’s recognition of the value and need to enhance awareness of and sensitivity to accompanying global cultural and language diversities. Recent growth in business with China has brought to the fore an acknowledgement that Mandarin is the language of rapidly growing markets in Vancouver and overseas and those who can communicate will profit. I recall my Mandarin teacher telling us of a “very famous” Canadian known as Dashan (“Big Mountain”) – a legend in China for his having mastered Mandarin as a second language. Turns out Dashan (Mark Henry Rowswell) has transcended the role of celebrity to become a cultural ambassador between China and the West. He was named Canada’s Goodwill Ambassador to China earlier this year.